The South Sudanese crisis has become the largest and most complex emergency in Africa. Security in South Sudan continues to deteriorate and close to four million people—one-third of the total population—are displaced. More than 1.7 million South Sudanese have fled the country and an estimated 7.5 million people are in need of urgent humanitarian assistance inside South Sudan, including more than 1.9 million internally displaced people (IDPs). Recent and continuing violence has generated new displacement, in particular in the Eastern Equatoria region and Western Bahr el Ghazal. The potential for further conflict in border areas persists, in particular in light of growing and widespread food insecurity, and with close to five million people in need of life-saving food assistance. Famine in parts of South Sudan is an increasingly likely scenario, and humanitarian actors have reported that an estimated 100,000 people are already affected by it in parts of former Unity State. One million children under five years of age are estimated to be acutely malnourished across the country, including 270,000 children who face the imminent risk of death should they not be reached in time with assistance. Protracted instability, brutal conflict and food insecurity are further compounded by a cholera outbreak which has spread to 12 counties in 32 states country-wide. The majority of South Sudanese refugees have sought safety in Uganda. 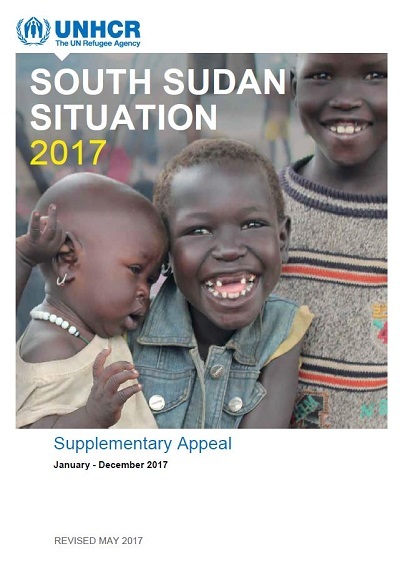 By the end of March 2017, the country was hosting 852,300 South Sudanese refugees and is struggling to cope with the ever-increasing needs. Some 195,000 South Sudanese arrived in the first three months of 2017 alone, an average rate of 2,000 refugees each day. Over 60 per cent of the new arrivals are children. An estimated 400,000 new arrivals from South Sudan are expected to enter Uganda in 2017. The Government of Uganda has maintained open borders and one of the most progressive refugee policies in Africa, promoting self-reliance of refugees and peaceful co-existence with host communities. However, urgent and massive support is needed to respond to the critical situation. Host communities and humanitarian agencies are struggling to feed and shelter the refugee arrivals and provide basic services. Providing access to safe drinking water remains an urgent priority in the dry lands of northern Uganda where refugees are hosted. By the end of March 2017, refugees also continued to arrive in the neighbouring countries of Central African Republic (CAR; 1,600), the Democratic Republic of the Congo (DRC; 74,100), Ethiopia (366,200), Kenya (95,300) and Sudan (379,700).